The challenge of balancing systemic and environmental moisture in horses' hooves. Hoof quality may relate more to the hoof's ability to regulate the moisture content than anything else. As the moisture content in the hoof wall decreases, the hoof becomes harder and tougher. Younger horses have softer hoof walls than older horses. There is a variation in the moisture content of young and old wall in the same hoof. The young wall of the heel and top is more flexible than the old wall of the hoof toe and bottom. Exercise has a positive effect on moisture circulation as it causes the hoof to flex. There is constant evaporation taking place from the hoof. Moisture must be replaced regularly to compensate for this loss in order to maintain an ideal moisture balance. Too wet, too dry? A healthy hoof contains the correct amount of moisure to maintain strength and avoid disease. Systemic water is transferred from the extensive blood and lymph supply of the sensitive structures to adjacent horn cells, and they, in turn, transfer it by capillary attraction to other horn cells in the hoof wall. Moisture is conducted up and down hoof horn tubule centers much like it is in the pith in a plant stem. Environmental water is conducted throughout the hoof in a similar manner from the ground. A balance of the two sources of moisture is maintained through the principle of osmosis. When one source is insufficient, the animal more heavily depends upon the other. Moisture retention is aided and evaporation loss is prevented by the anatomy of the rigid, closely spaced, flattened horn tubules in the external portion of the wall and by the periople of the coronet. The “hoof varnish” that flakes off from the underside of the periople and is carried down as the hoof wall grows out, may also assist in retaining hoof moisture. However, since it is a very thin layer of cells, it is usually worn off and absent from at least the lower half of the wall. The contribution that hoof varnish makes to the prevention of evaporation from the hoof is therefore very insignificant. A dry sandy lot is a good environment for a horse as long as hoof moisture can be maintained. 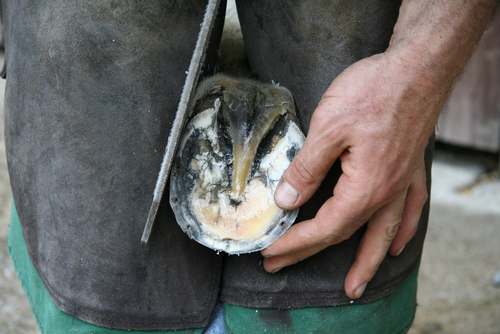 Commercial hoof dressings are usually unnecessary due to the overlapping structure of the tubules in the hoof wall. Water is nature's hoof conditioner. The ground surface portions of the horny sole and frog dry and harden and are retained longer when environmental moisture is low. 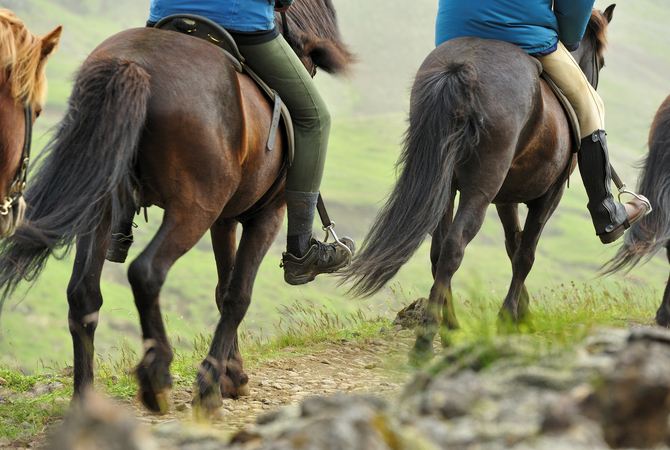 Horses in dry environments generally have healthier feet than those kept in wet ones. Chemical hoof hardeners can be used to harden sodden hooves. Horseshoe clips and hot fitting of horseshoes are especially helpful in holding shoes onto weak hoofs. Hot fitting has additional benefits of sealing the ends of the hoof wall tubules, preventing moisture loss and hardening the hoof. A dry sandy lot is a good environment for a horse as long as hoof moisture can be maintained. One way that has proven effective is to overflow the water trough so that the horse will have to stand in a wet spot to drink. Another is to dampen the hooves by rinsing off the horse after riding. Horses in a desert environment can usually adapt to the dry climate by changing from relying on environmental moisture to relying on systemic moisture. Factors that encourage ideal hoof moisture balance in a dry climate are: ground water that horses can periodically stand in (such as that purposely overflowed around the water trough), a nutrient sufficient diet, daily packing of saturated clay in the bottom of the hoof (such as is done at race tracks), antiseptic hoof packing under a pad and shoe to prevent evaporation, and, in rare cases, applying an oily hoof dressing after moisture is added to the hoof. Factors that interfere with hoof moisture absorption and circulation are: stabling in deep manure and urine salts, careless and excessive rasping of the sides of the hoof, hoof boots, traveling on hot pavement, a nutrient deficient diet, and hoof hardeners - turpentine, formaldehyde and bleaching agents. Each part of a healthy hoof has different moisture content. The wall is approximately 25 % water, the sole 33 % and the frog 50 %. Exact measurements usually indicate the wall and sole are slightly higher and the frog somewhat lower than these approximations. Hoof moisture content varies depending on the systemic and environmental conditions. Variations in moisture content among and within hoof parts influence several of the important qualities of hoof horn, including elasticity and hardness. The frog is the most elastic, and the wall is the least. The wall increases in elasticity from toe to heel. The young thin wall of the heel is more elastic than the older thick wall at the toe. The moisture content of the wall does not vary, on the average, more than 2 % from the coronary to the sole borders of the hoof. According to Japanese researchers, age of the horse has an effect on moisture content of hoof parts. They found as a horse ages, the wall increases about 3 %, the sole remains the same, and the frog decreases over 10 % in moisture. Normal hind hoofs only contain 0.05 % more moisture than front hoofs. Hoof water content is higher in males than females. Of course, regular trimming and rounding of the edges of the hooves by a qualified farrier is necessary to prevent excessive cracking and splitting. And, when necessary, horseshoes should be applied to prevent damage to sensitive structures when hoof wear exceeds hoof growth. His books, including "The Principles of Horseshoeing," are the most widely used in the world on the subject of farriery. 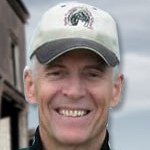 A popular speaker, Dr. Butler has spoken at many national horse symposiums and has been a featured speaker at Veterinary Congresses in Argentina, Australia, Canada, Great Britain, and Switzerland. He has addressed the AAEP and the first Florida Association of Equine Practitioners Conference. One of less than 1 percent of farriers in the U.S. to have a Ph.D.
One of 550 Certified Journeyman Farriers in the U.S. He is one of 158 Fellows of the Worshipful Company of Farriers since 1356 A.D.